The American Institute of Architects, New York chapter, has brought together a diverse group of bloggers and designers, a photographer and a professor, all to talk about the changing role of architectural icons and city images in the information age. 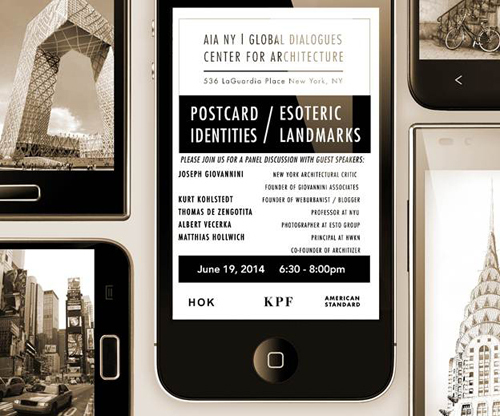 A summary of my own presentation at this event (hosted by the Center for Architecture in Manhattan on June 19th) is included below, accompanied by source links with additional information. Iconic Images: In the age of social media and information, what are the iconic images of a city and its buildings? The idea of a single architectural icon within a city, or an iconic view of a city, has been replaced by a multiplicity of images as images proliferate in our digital world. At the same time, communities are creating new icons for and of themselves, like the crowdfunded Favela Project in Brazil, which in turn are propagating through and bolstered by media attention, traditional and social. Collective Imagery: Does the propagation of architectural imagery, the collective image of a place affect the conceptualization of a building and play a role in urban planning? The notion of ‘collective imagery’ can take on new meaning, beyond the conventional connotations of ‘collective memory’. As our global archive of actual collected images grows, so does the very real potential for redeploying and combining those pictures in novel ways. The Photosynth project showed the world how user-submitted Flickr shots could be reassembled into an interactive landscape by combining photographs of landmarks. Hyperlapses illustrate the potential for ordinary people to create dynamic shots, rotating timelapses around civic icons. Cinemagraphs, meanwhile, allow creatives new ways to interact with and animate iconic images (and images of iconic buildings). Esoteric Landmarks: What are the esoteric or iconic landmarks of our times? The rise of images shot from unusual perspectives has resurfaced forgotten phenomenon, like the mysterious airmail arrows that once guided planes across the United States, made visible again in part thanks to Google Earth. Mobile apps have, meanwhile, enabled people on the ground (and on the go) to engage with existing landmarks in new ways, including semi-secret or hidden ones that have no marker in physical reality. And then there are projects like Points, designed to allow users to input their own target landmarks, or to feed travelers streams of real-time urban data flowing from Twitter, RSS and other APIs. Perhaps ‘landmarking’ has become more subjective, an interactive and reflexive activity, tied more to people and times than just places. Social Travel Journals: How has the architectural travel journal evolved through the use of social media to record our findings, explorations and experiences? Beyond the obvious candidates (Tumblr, FourSquare, Pinterest, Instagram, Twitter or Facebook) are some subtler contenders for strangest new travel journals. Consider the street artist, for instance, who takes cell phone camera pictures inside the virtual world of a game, shooting candid photos of faux people. Or, shifting back to physical built environments: the cinematographer who captures 3D stereographic (panoramic) views using a DIY ball of GoPros, sharing videos and instructions on his blog and Vimeo. And then there are all of the otherwise-inaccessible places we can now tour through Google Street View, like Battleship Island in Japan (see also: Kowloon Walled City in Hong Kong, the Tower of David in Caracas and Garbage City outside of Cairo). On the flip side, digital iconography is bleeding back into meatspace with humorous installation art projects featuring recognizable icons from Google, Instagram, Apple and more, all playing on the tension between familiar symbols and the filtered realities they represent. Civic Identity & Planning: Has the civic identity of a city, its planning and its architecture evolved through the changing lens? Of course, all of this raises practical questions, like: what do these changes and possibilities mean for architects, urban planners and others who seek to both document and shape the urban environment? Starting small and local, consider ‘sneckdowns‘ (a combination of ‘snowy’ and ‘neckdown’) as applied in Philadelphia. Local authorities turned the viral phenomena of documenting leftover snow patterns on winter streets, then used it to generate real changes to the curbs of an area intersection. Blogs drove this project. In Istanbul, one retired engineer’s attempt to beautify area staircases with rainbows of paint snowballed into a politicized local crusade when the municipality attempted to whitewash his work. Social media fueled this movement. On a larger and broader scale, the proliferation of images featuring the iconic High Line park in New York (America’s largest city) has sparked similar elevated greenway plans in Los Angeles and Chicago (the 2nd- and 3rd-largest, respectively). Many citizens of these cities have never seen the High Line in person, but were sufficiently inspired by images of it to rally behind similar ideas set in their own urban centers. In gathering material for this presentation I spent a great deal of time passing over and considering past articles from WebUrbanist, some of which will make good further reading material for those interested in the intersection of urbanism and imagery. These links cover subjects from do-it-yourself hactivism and crowdsourced urbanism to crowdfunded skyscrapers and solar roadways. Though only one example made the final cut, there are so many great artists working to deconstruct and reconstruct architectural and infrastructural facades, or even strip cities down to their impossibly dark essentials. Here are a few great illustrations of how cities change over time, shown via before-and-after photos and then-and-now sets.Visualizations can also show us normally-invisible patterns, be they the evolution of physical cities, the hidden networks within them or places that do not even exist. Augmented reality provides a huge series of architectural subjects relating to digital technology, from hand-held architecture and model overlays to geo-tagging and catalog shopping. Everyday apps hold fun surprises too, both for extroverts who want to get to know their neighbors and introverts who wish to avoid social interaction altogether. Aside from the frivolous and fun, there are some more serious and social-minded pieces that could have been included: homeless hotel to raise awareness, open-source street store and pop-up parks, for instance. Hopefully a few of those spark your interest and keep you thinking about the subjects addressed or hinted at here.